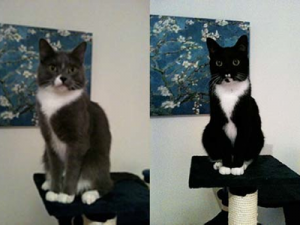 I was a bit worried about leaving my two cats so soon after they had come to the UK. Luckily, I found Anita and was soon convinced that I could not be leaving them in better hands. Her daily updates and photos reassured me that they were doing well and allowed me to fully enjoy my holiday. When I returned, my boys were mellow and obviously had been well cared for. I cannot recommend Anita highly enough, and look forward to having her take care of my cats in the future.